Autumn in Illinois Means Apple Festivals! Along with cooler days and colorful trees, autumn in Illinois means apple harvest. Fortunately for residents and visitors, there are a wealth of orchards scattered across the state, many of which offer pick-you-own options. But the real fun is the celebrating all things apple. So book a room at a local B&B (we’ve listed two below) and take in one of these great fall fests. Murphysboro Apple Festival. This is the granddaddy of all apple fests in Illinois, winning the honor of the oldest and largest. 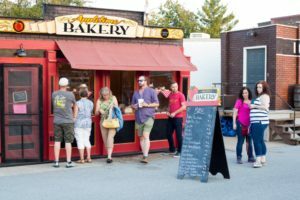 The four-day fest draws more than 45,000 people with a celebration that includes a Big Muddy Apple Obstacle Run, Grand Parade, arts and crafts fair, live music, car show and most importantly, apples in every delicious way. Wednesday, 6:45 a.m. – 10:00 p.m.
Thursday, 9:00 a.m. – 10:00 p.m.
Friday, 9:00 a.m. – 10:30 p.m.
Long Grove Apple Fest. This three-day festival is a great option for Chicago-area residents (Long Grove is about one-hour north of the city). While there are family-themed activities and apple-themed games (pie eating contest, anyone? ), the real draw is all the yummy apple concoctions—apple pies, cider donuts, apple cake, apple butter and scones, caramel apple sundaes, caramel apple martini and lots more. Live music all day, every day adds to the festive spirit. Free admission for everyone, Friday, 11:00 a.m. – 2:00 p.m.
Barry Apple Fest. Head out to this quaint historic town in west-central Illinois for its annual event. Enjoy a parade, car show, crafts show, and delightful performances by a bluegrass band, and all sorts of apple-icious foods, such as apple pies, ice cream and strudels. Thursday, 6:00 p.m. – 9:00 p.m.
Friday, 5:00 p.m. – 9:00 p.m.
Saturday, 9:00 a.m. – 9:00 p.m. If you’re heading to western Illinois, book a room at The Timmermann House in Clinton County. Not only will you find luxe accommodations in a lovely restored farmhouse, but delicious breakfasts made with homegrown ingredients. 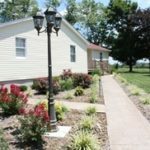 When visiting the Murphysboro area, check out the cool cottage accommodations at Von Jakob Winery & Brewery. Choose from one of five stylish suites and enjoy a welcome basket plus a complimentary bottle of wine from the winemaker’s selection. 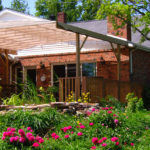 This entry was posted in Festival, Food and wine, Illinois Bed and Breakfasts, Local attractions and tagged Festivals and events, Illinois Bed & Breakfasts, outdoor activities by admin. Bookmark the permalink.